The WC-20 and WC-50 Watercart are rechargeable, battery operated, portable watering systems for interior or exterior use. Great for interiorscape, garden centers, flower shops and anywhere portable watering is needed. The battery operated pump has a flow rate of 5 gallons per minute for fast watering of containers with little spillage. The smaller unit's 20 gallon tank can be refilled 15 times, for a total of 300 gallons, before the battery needs to be recharged with the included charger. A trigger valve makes watering easy and prevents spills. A variety of nozzle choices offers flexibility in watering. Each WaterCart comes equipped with a 1/2" x 25' hose for maximum flexibility. 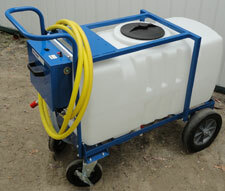 Both the 20 and the 50 gallon WaterCart use our 5 gpm, battery operated pump. On a full charge, the unit should pump approximately 300 gallons before needed to be recharged. Unlike bladder tank watering carts, the WaterCart does not lose pressure once the tank starts to empty, keeping a constant flow rate from the first pot watered to the last. to keep plants watered, sell more and build customer loyalty. Please contact us at the numbers to the left or email us with questions. 20 gallon cart with battery operated pump for portable watering. Pumps 300 gallons before a recharge is needed. ITEM SIZE NAME BROCHURE MANUAL SHIP WT. 50 gallon cart with battery operated pump for portable watering. Pumps 300 gallons before a recharge is needed. Pricing is FOB Manitowoc, WI. All pricing is subject to change. 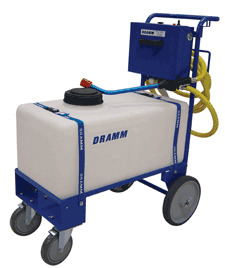 Not sure what type of sprayer you need?